Since posting about mass-produced motoring helmets and later Protective Helmet-ish headbands for motorists I was curious to learn more about the latter, produced at the University of Adelaide. 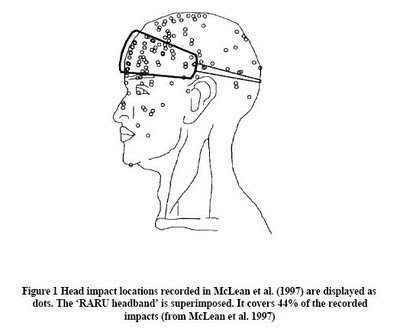 It's taken a while but I finally recieved the study done in 2000 at the Road Accident Research Unit at the U of Adelaide, called CR 193: The development of a protective headband for car occupants (Andersen, White, McLean 2000). A chap at Road Safety Policy, Department of Infrastructure & Transport in Australia was kind enough to send a link to the Australian Government website wherein the study is presented. I don't think cyclists should be bullied with helmet promotion and threatened with legislation when there exists a very real and present danger to car occupants. I think that the car lobby as well as the general population should be presented with more data and facts about the dangers of driving. It's only fair and logical. "Car crashes remain a significant source of head injury in the community. Car occupants have an annual hospital admission rate of around 90 per 100,000 population. Of drivers who are admitted to hospital, the most serious injury is usually to the head (O'Conner and Trembath, 1994). In a previous study, McLean et al. (1997) estimated the benefits that are likely to accrue to Australia from the use of padding of the upper interior of the passenger compartment. This study specifically examined the effects of the ammendment to the United States Federal Motor Vehicle Safety Standard 201 (FMVSS 201) in which passenger cars have to pass head impact tests with the upper interior. That report estimated the total annual reduction in harm to the Australian community to be around $123 million. 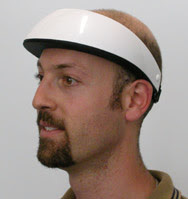 But more impressive were the estimates of introducing protective headwear for car occupants. The authors of the report estimated that the annual reduction in harm would be in the order of $380 million. The benefit of padding the head is that the head is protected from strikes with unpadded automotive components, exterior objects and in vehicles that predate any eventual introduction of padded interiors." These are Australian numbers so the numbers for annual reduction in harm would be even higher in the EU or US. "The results from Phase 3 indicate that a headband can greatly reduce the severity of an impact to the head. HIC was reduced by 25 percent [...] when compared with an impact with no headband." 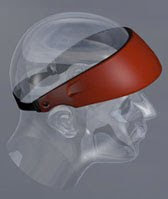 The RARU headband prototype covers 44% of impact points usually suffered by car occupants. You can see on the photos at top that the protective area was actually extended when the prototype was designed so this 44% must be a bit higher. "The results from Phase 3 indicate that a headband can greatly reduce the severity of an impact to the head. HIC was reduced by 25 percent [...] with the use of 25 mm of BB-38 polyurethane, and 67 percent with the honeycomb cardboard prototype, when compared with an impact with no headband." "We recommend that further investigation is made into materials of a honeycomb structure to find a material of the correct crushing strength and durability. We also recommend that prototypes be developed further to be included in a testing program that would include other vehicle structures tested over a range of velocities." It gets extremely difficult to ignore the bull when you're looking at this kind of science. If we're serious, as societies, about really saving lives, these headbands should be promoted on all levels. There are two positive effects: One is that there will be fewer head injuries among car occupants. The other is that we would be informing people of the danger of driving and thereby branding driving as dangerous which will only serve the cause of encouraging people to consider safer transport options like... oh I don't know... cycling? 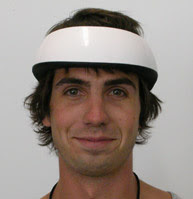 Here's a link to the Australian Government website about the motorist headbands.